This is Jason Rowe and his Star Wars Galaxies avatar from Robbie Cooper's Alter Ego project. Mr. JASON ROWE: My condition is called muscular dystrophy (unintelligible) Duchenne Muscular Dystrophy, which pretty much affects all the muscles of the body and they don't function. 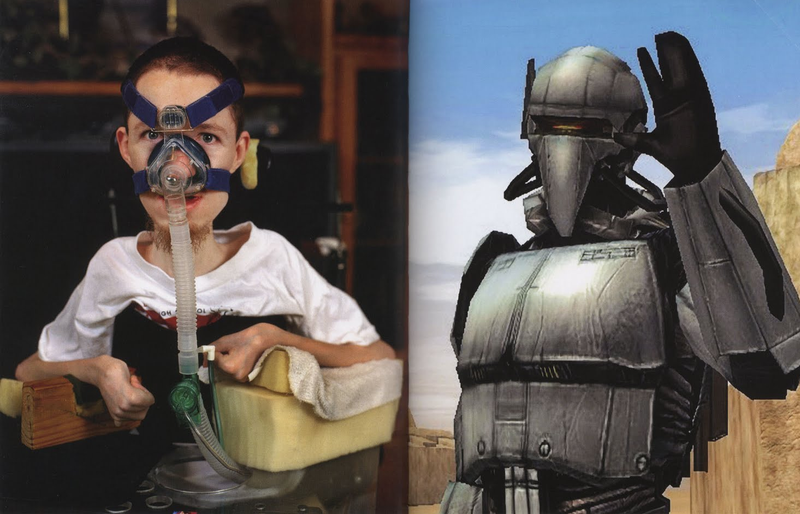 LEVINE: Jason Rowe does have a little movement in his thumb, which enables him to play "Star Wars Galaxies" an average of 80 hours a week, where his steely, robot-like avatar rides Imperial speeder bikes and fights monsters; his head helmeted, his face unseen. Mr. ROWE: My character in the game is a lot different from what you see here in real life. Pretty much gave me a window to the world. LEVINE: In the four years since he created his avatar, this frail 32-year-old has had an unprecedented life experience. Online he is treated as an equal among his peers, not disabled, he says. Not in a wheelchair. In virtual worlds, he adds, everyone is on common ground.